Nick and I have started a little tradition. Every year, for his birthday, I enter him into a race. It started last year with the Abbey Dash. 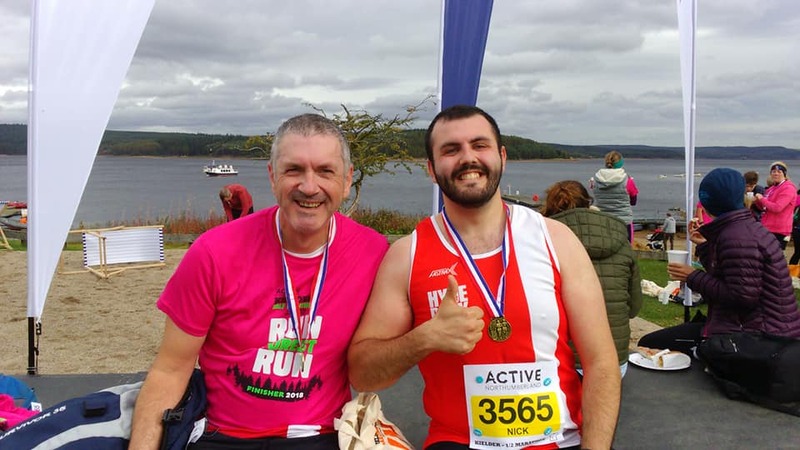 This year… the Kielder Half Marathon (http://kieldermarathon.com/half-marathon/) – his first half. Following an overnight stop at Abbie’s in Durham we left a frosty Durham at 7:30, arriving at Kielder at 9 for a 10:15 start (plenty of time, I thought). There’s well signed, free event car parks dotted along the west shore – filling up from the south end. We ended up in the furthest car park at 9:45 and then (after using the facilities) joined the queue for the free shuttle bus to the start. This turned out to be very well organised – we were assured that the start was delayed. We arrived at the start at 10:15, dropped our bags off and then loitered in a large marquee out of the elements. The start was at 10:30. 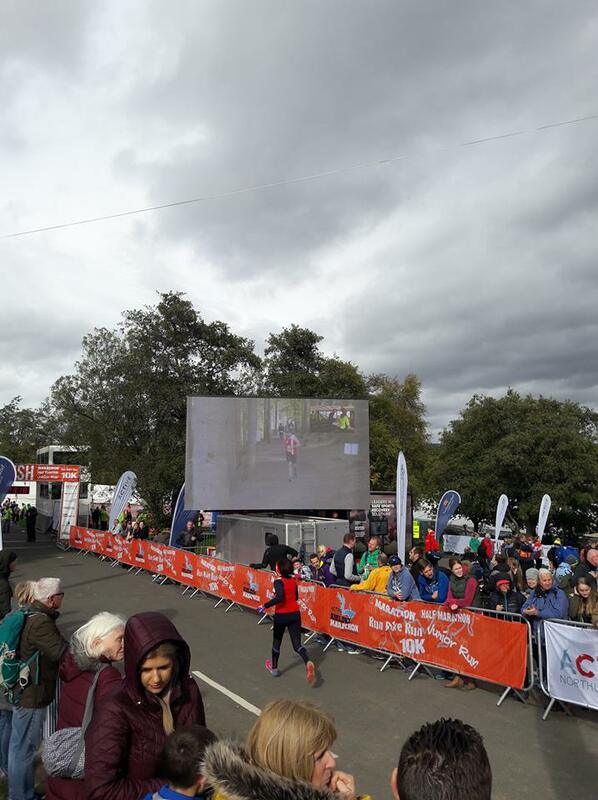 There were 650 marathon runners and 900 for the half. 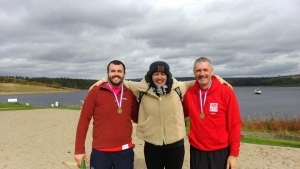 The marathon starts and finishes at Kielder Village (the main event village) and is a full lap of reservoir. The half starts from dam a few miles to the south and is a point to point (over the dam – 5k loop through the forest – back over the dam – then along to Kielder Village – https://www.strava.com/activities/1890003234). The route mostly follows the Lakeside Way multi-user trail – good surface – the only tarmac being across the dam + a short stretch of disused road. I wore trail shows, Nick road shoes – both were fine. The route is described as hilly – but it’s nothing you haven’t seen in Yorkshire – lots of ups and downs – one or two long ups and downs. The route was well marshalled. There were water stops every 5k or so – cans of water(!!?) + two isotonic drinks stops – paper cups. You can hear the finish from about 2k out. There’s a large screen so that spectators can see who is approaching the finish. Abbie, seeing Nick come through first, feared the worst for me. I then came through 2 minutes later grimacing. 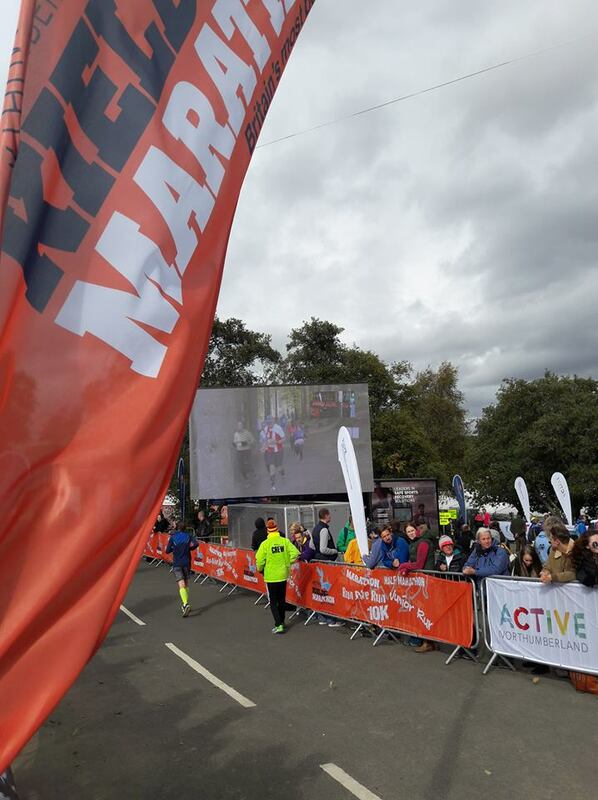 At the finish – water, t-shirt (“Run-Forest-Run”), medal, bananas – cotton goodie bag (protein bar, mars bar, isotonic drink, leaflets, fridge magnet) – bag collection. 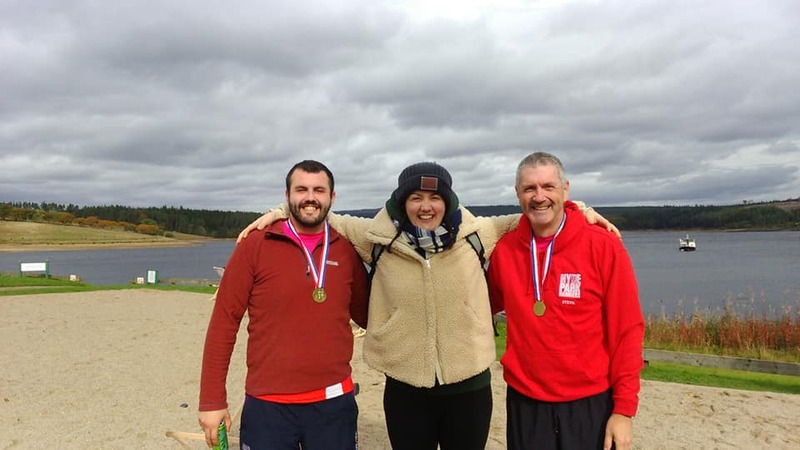 The event is chip timed (http://chiptiming.co.uk/events/kielder-half-marathon-2018/). Chipped bibs + information were posted out about three weeks ago. Weather – dry, slightly cloudy, 7C and windy/breezy. There was a free shuttle bus back to the car park – again well organised. 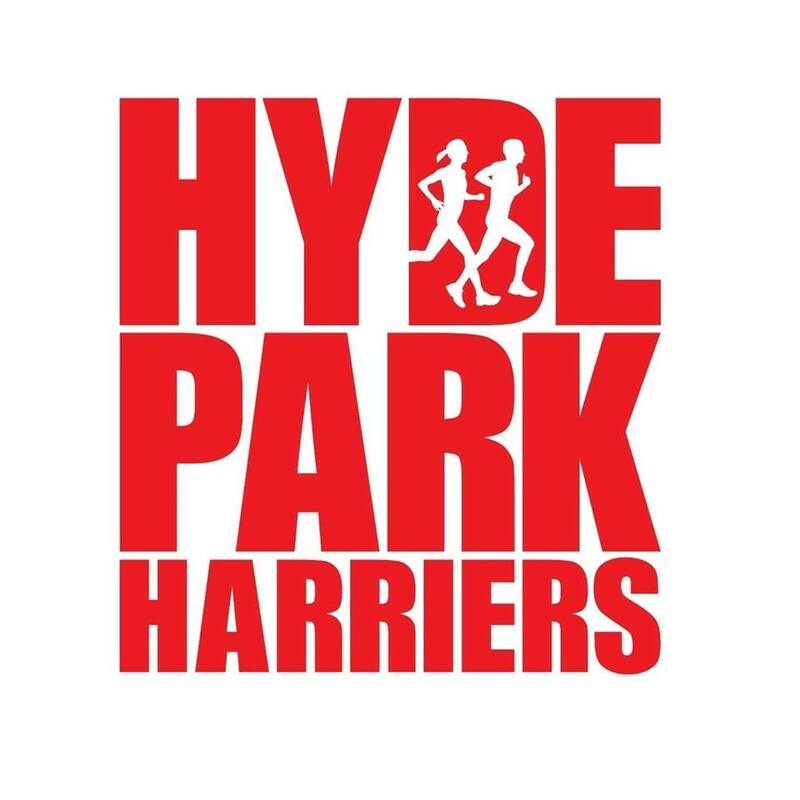 – There is also a 10k race on the Saturday and Junior runs on the Sunday. – Spectators can also use the shuttle buses. They said £3 beforehand – but it was free for all on the day. – For those not wanting to drive up, there is a shuttle bus from Newcastle Central Station also available (prebook for £10 when signing up). – Transfers and refunds are not allowed, although they did agree to me dropping down from the full to the half. 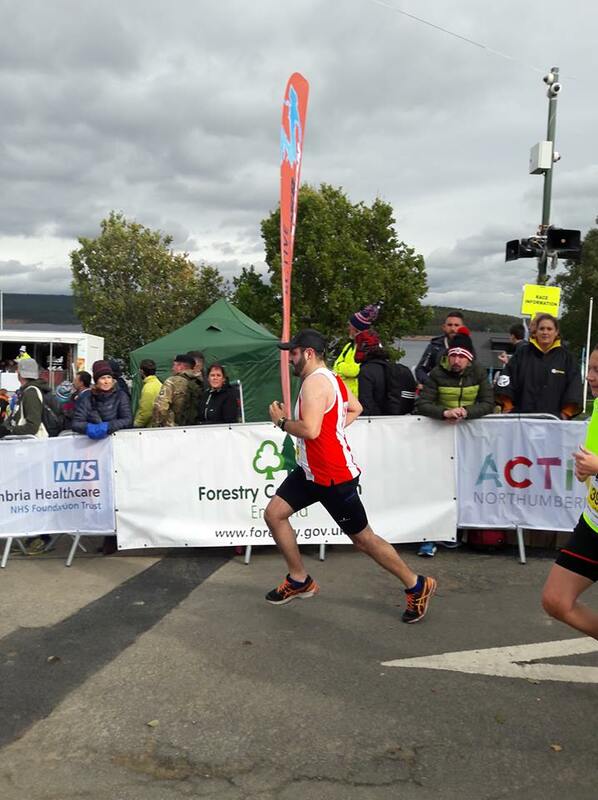 That involved me entering the half separately and then them refunding the fee for the full (less a £3 admin fee). Well done Nick! Thank you Abbie for the support.